A detailed account of one of the world’s great battles, the fateful encounter between the fleets of Western allies and the Ottoman Empire. In October 1571, the “Holy League,” made up of forces from Venice, Spain, the Papal States and elsewhere in Mediterranean Europe, sent a great armada against Sultan Selim II’s battle-hardened forces, agents of an undisguised program of imperial expansion and of jihad. 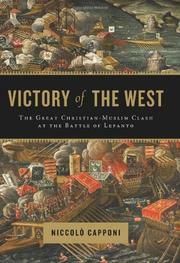 For Italian historian Capponi, there’s no sweetening the latter term; as he writes, jihad implies “holy war on behalf of Islam,” as the massacre at Otranto, still resounding in Christian Europe, demonstrated all too clearly. Determined to stop the Ottoman push toward Rome and other key points, the Holy League’s forces gathered along the western coast of Greece and lured “the Lord Turk” into the straits off Lepanto. As Capponi records, the battle hinged on many factors, some unforeseeable. One was the steady improvement in Western military technology, armaments that brought shock and awe to the enemy, even though Capponi urges that it would not be for another century that technological superiority would prove decisive. Changes in military organization and command structure figured. Politics also played a part, and to read Capponi’s account is to be constantly surprised that the bickering allies could have pulled victory away from the monolithic Ottomans. Yet they did, in a fierce battle that cost the future novelist Miguel de Cervantes an arm and turned on one of the finest flanking maneuvers in naval history, a textbook case even today. Capponi provides enough geeky detail to satisfy a Tom Clancy fan, but this is a story told as a story, and he does well—especially in the matter-of-fact ending, in which the principal players in the battle, winners and losers alike, suffer the effects of politicking. Illuminating reading for students of early modern European history.